The wife of the Indian Ambassador to Russia talks to RIR about her interest in diverse cultures, her books and initial impressions of Moscow. The Summer Bazaar, which was held on May 31 at the Indian Embassy in Moscow, is an annual charitable and social event. Every year, thousands of Indian and Russian guests visit the bazaar, which is organised by the Indian Women’s Association (IWA) in Moscow. 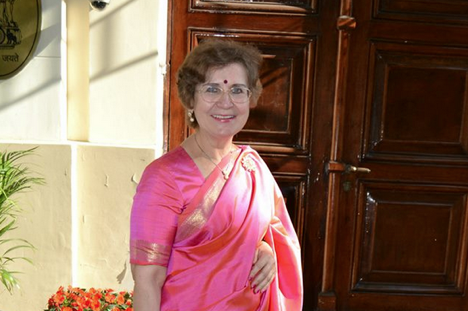 RIR’s Elena Krovvidi had an opportunity to catch up with Barbara Raghavan, who heads the IWA and is the wife of Indian Ambassador to Russia, P.S. Raghavan. In this interview, Mrs Raghavan, who is of Polish origin, talks about her passion for writing, living in different countries and her initial impressions of Moscow. What can you tell us about this year’s Summer Bazaar? Indian Summer Bazaar is an annual event which is marked in the social calendar of Moscow. This year the Summer Bazaar had something to offer to everybody. We had activities for men, women and for children of all ages. We also showcased Indian culture and cuisine as well as music, dance, handicrafts and other Indian goods. The income from these activities will be used to extend financial assistance to Russian and Indian charitable institutions. You have spent many years in India with your husband. How close is Indian culture to your heart? I am a citizen of India and I fully identify myself with Indian culture and Indian people. I am proud that I have this opportunity to represent India abroad. I consider myself lucky whenever I can do something for the country and the people, just like this time through this bazaar. Not only, as I mentioned earlier, a part of the proceeds is used for charitable organisations in India but also this event presents an opportunity for the Indian community to get together and spend some time in the Indian home which is the embassy. I love Indian dance and music. And I love Indian people because they are warm and friendly. In your opinion, does India have anything in common with Russia and Poland? I find that there are many factors common for people of India, Russia and Poland. Firstly, the family values and traditions are cultivated in these countries. Also, people in Russia love Indian dance and music and there is a lot of interest among people in India in the Russian culture. Bollywood films are greatly popular in Russia. Has Indian philosophy had an impact on your book “Born to be perfect” where you explore and analyse the quirks and peculiarities of human nature? I placed the action of my book in India because I know this country so well. But the book is about human mind and imperfections of human nature, which are very universal. I gave it a paradoxical title “Born to be perfect” to point out that so many of us are seeking perfection which is not possible to achieve. We are not perfect but we all strive for perfection. Our parents encourage us to be perfect. We try to live up to society’s expectations. Some people are emotionally strong so the expectations don’t bother them. But sometimes people feel not up to it, they feel that they are criticised, not loved and not understood. It’s about pressure, how you get obsessed about certain behaviours. In fact, the main character is a boy who suffers from Obsessive-Compulsive Disorder (OCD), he comes from a dysfunctional family. We should do our best to live in accordance with the rules of society but we don’t have to be perfect, we should be happy with ourselves. You are currently working on your second book on abortions. There are demographic problems in both India and Russia, although of a different kind, so the topic of your books is highly relevant. Can you tell us more about this book? This book is about to be published very soon. It deals with abortion with relation to a specific case of a 50 year old woman. Do you remember the case of a woman who had health problems and died after being denied an abortion in Ireland? I am not trying to answer the question of whether abortion is right or wrong. Nor do I deal with demographic problems. I just present the psychological problems connected with aging and an unplanned pregnancy. We know that you have two sons: Sirish and Anish. Where do they study? Have they made up their minds about their future professions? Both have chosen their field of study according to their interests and aptitude. Sirish is doing a Master’s degree in international relations, whereas on the other hand Anish is doing a Master’s degree in engineering. They are both looking for a job commensurate with their qualifications. What are your impressions of Russia? Do you have favourite places? I love picturesque Russian cities, onion-domed churches and colourful buildings. I enjoy walking on the streets of Moscow. We arrived in January and the process of settling down as well as snow and cold made me postpone visiting places. With the onset of spring I saw more of Moscow. I also visited St. Petersburg and Kazan. Recently, my husband and I went to Yasnaya Polyana which is Tolstoy’s birthplace. I enjoyed the serenity of the place and was thrilled to listen to information about Tolstoy and his life, his philosophy and his close association with Mahatma Gandhi. As the Ambassador has an illustrious career, you have lived in many interesting places. What is your favourite city and what do you like about it? Each place that we lived in gave me fantastic memories and I think about them with nostalgia. Our first posting was in London and I loved seeing the places which till then I knew from films or literature. We lived close to a place where the fictional home of Sherlock Holmes was situated as well as of Bertie Wooster, the character of books by P.G. Wodehouse. In Ho Chi Minh City I remember the friendship with the local people and the unforgettable view of graceful Vietnamese girls wearing their white “ao dai”, gloves and big hats, riding bicycles to work, their long black hair unruffled by the ride and in contrast with their white dress. Pretoria is known as “Jacaranda city”. In October and November streets of Pretoria are lined by Jacaranda trees. The views are breathtaking. I loved Prague with its historical walks and music and Dublin with its literary background - home of Oscar Wilde, James Joyce, Oliver Goldsmithand others. I love the wonderfullyfriendly Irish people. I left each of these places with sadness but I was always curious about the next one. Now we are in Moscow and I have already fallen in love with it.